'Chy Fons’ in Mullion, is a contemporary single storey property that has been refurbished and modernised with high quality in mind. Off-road parking for 3 cars, a private garden and distant sea views certainly make this a perfect holiday home for enjoying all that Mullion has to offer. A five minute walk from Mullion village centre with its pubs and shops and only 10 or so minutes walk down to Polurrian beach. The open-plan kitchen, living and dining area enjoy lots of natural light from the large windows overlooking the garden. The spacious lounge area has comfortable seating for six people with a coffee table, large 55” 4K Ultra HD Smart TV with freeview and DVD player. There is wood effect laminate flooring throughout the property. The beautiful bright well-equipped kitchen has an American style fridge freezer, double oven incorporating grill and 4-ring induction hob with extractor over, microwave in top oven, dishwasher, plenty of storage space and a fitted wine cooler. The dining area with solid oak dining table, four chairs and a leather-padded bench is positioned by the sliding doors that open to the patio area and garden. There is also a utility room with AEG washing machine, tumble dryer and sink, as well as further storage. Bedroom one has a 6' super king-size bed which is zip and link so may be made as a twin room by prior request. With oak furniture including bedside tables with lamps, wardrobe, chest of drawers and an LCD TV. En suite shower room with large walk-in mixer shower, toilet, handbasin with lit mirror over and a heated towel rail. A door opens onto a small patio at the side of the property which catches the midday sun. Bedroom two has a 5' king size bed with bedside tables and lamps, an oak wardrobe and chest of drawers. En suite shower room, fully tiled with mixer shower, toilet, handbasin and heated towel rail. Bedroom three has two twin 3’ beds which can be made into a 6’ super king bed by prior request. Oak furniture including bedside tables with lamps, wardrobe and a chest of drawers, LCD TV. There is also a door to the small patio which is shared with bedroom one. All beds have luxury 500 thread count bedlinen, hotel luxury quality posture beds and non allergenic duvets and pillows. The family bathroom is fully tiled with a bath with mixer shower over, toilet, handbasin and heated towel rail. A feature skylight (obscured glass) fills the room with natural light. 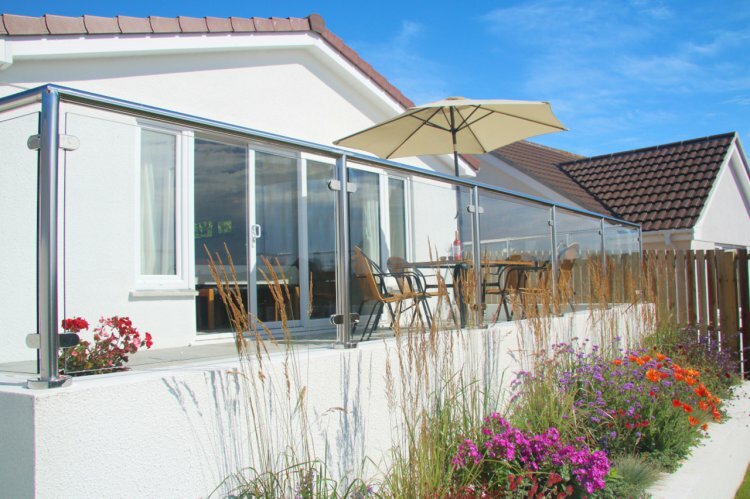 Outside is a south facing patio with garden furniture and distant sea views. Steps take you down to the good size enclosed garden with planted borders. Mullion village has several convenience shops, a post office and two pubs, all within easy walking distance of Chy Fons. The beach at Polurrian is also a short walk down an unmade lane. From Polurrian beach you can also follow the coast path over to Poldhu beach or in the opposite direction, Mullion Cove. We regret no children under five will be accepted and all other children must be supervised at all times. Regret no dogs and no smoking. There is a driveway with room for three cars. Rental includes bedlinen, towels,underfloor central heating, electricity,water and Superfast BT Infinity. Fully fitted kitchen with fridge freezer, dishwasher, double oven, grill & 4-ring hob. Living area with two sofas and comfy chair, 55" TV & DVD. Dining area with oak table, 4 chairs & bench. Sliding door to patio with glass top table & 6 chairs, steps down to garden. Bedroom one with super king bed, wardrobe, drawers, LCD TV. En suite with walk-in mixer shower, toilet & handbasin & heated towel rail. Bedroom two with king size bed, wardrobe, drawers. En suite shower room with mixer shower, toilet, handbasin & heated towel rail. Bedroom three with super king zip & link bed, wardrobe, drawers & LCD TV. Family bathroom with mixer shower over bath, toilet, handbasin & heated towel rail.